Careers for interior design graduates are available in private consulting practice (architecture, interior design and multidisciplinary design firms; product-manufacturing companies, etc. ), corporate/institutional practice (cultural and historical resource organizations, design sections of contracting companies, facilities departments within private corporations, hospitals or universities, etc. ), as well as public practice (federal, state, regional, county and municipal government agencies; university or college design or facilities services) and nonprofit organizations (community development groups; agencies dealing with self-help or home/work accommodations for people with disabilities; neighborhood and community advocacy groups). 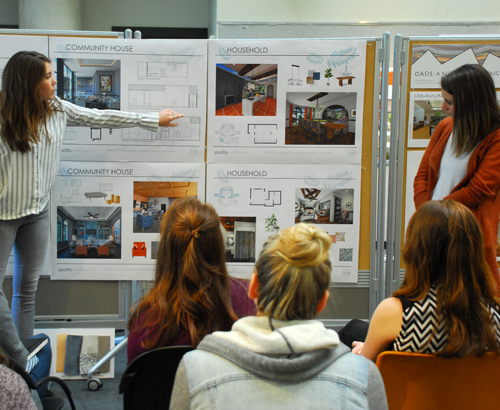 The following career paths reflect specific positions pursued by recent interior design graduates from Iowa State University, and do not represent a comprehensive list of the possible career choices available to someone with an interior design degree. Please note that some careers require additional education beyond the bachelor’s degree.